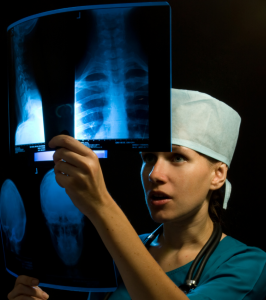 Radiology is an important and longstanding part of the medical field. Every day, x ray technicians use the technology to help spot abnormalities and diagnose issues with patients. Today’s x ray technicians use primarily computed tomography and magnetic resonance imaging (MRI), but there are several other areas of specialization withing the field of radiology. Some technicians, known as mammographers, focus on low-dose x ray systems used to produce analyze the breast. Radiology technology is a popular choice for many students looking to enter the medical profession. Job prospects are looking good and certification can be earned in as little as two years. The most popular x ray technician programs last two years and students work toward an associate degree. Many vocational schools and colleges offer this degree, but you’ll want to make sure the institution you choose is accredited. This will ensure that your degree is recognized by hospitals and clinics throughout the country. Most states require radiologists to obtain licensing before they work with patients. While the requirements vary by state, you can expect to take some kind of certification test before being admitted to work as an x ray technician. In most states, licenses must be renewed every two years and a certain amount of continuing education is required to stay licensed. Job prospects are looking good for those interested in becoming an x ray technician. The Bureau of Labor Statistics estimates 28 percent job growth through 2020, which is considered faster than average. The demand for radiologists is being attributed to a a higher aging population. Hospitals are expected to hire most radiologists, but x ray technicians will also go to work for private physicians’ offices and imaging centers. Jobs outside of the hospital are also expected to grow due to an added emphasis on outpatient care, according to the Bureau of Labor Statistics. This is a great career option for anyone who enjoys a fast-paced hospital atmosphere. As an x ray technician, you can expect to spend much of the day on your feet. There are radiation hazards, but those are negated by protective clothing and shielding devices. This work is typically full time. Who Would Make A Good X Ray Technician? Those who become radiologic technologists are usually drawn to the medical profession out of a sense of duty. They enjoy the hospital atmosphere and the opportunity to help other people. Like nurses and physicians, x ray technicians are compassionate people with the ability to comfort patients during stressful situations. Successful radiology technicians are also technically proficient and have strong analytical skills. Keeping detailed records and ensuring technical equipment is functioning properly is an important part of the job. How Much Does an X Ray Technician Make? Radiology technicians can expect to earn around $54,000 per year. The top ten percent earned more than $76,000 per year. The income potential is great in this area of the medical profession, particularly considering most x ray technicians only took about two years of school. To launch a career in radiology, it’s important to determine how much you want to invest in school, and what type of program will work for you. Those with full-time day jobs often decide to take evening and online classes while recent high school graduates prefer to take day classes. When you choose a school, look into scholarships and grants that could help you pay for schooling. Student loans are an option, but weigh your options. You don’t want to get stuck with a high interest rate and astronomical loan payments upon graduation. – Are You Looking at the Right X Ray Tech Schools? – What Does a Radiologist Technician Do? – Will You Make a Good Living With an X Ray Technician Salary? – What is the Average Radiology Tech Salary? – What Radiology Technician Schools Are Right For You?